Three SRC members have made CPUT proud by flying its flag high in conferences around the world. 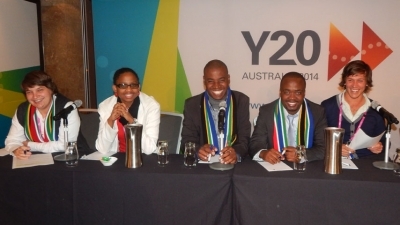 SRC President Mbongiseni Mbatha and Surita Venter, an SRC member on the Wellington Campus, recently spent four days in Sydney, Australia, attending the Y20 Summit with four other youth representatives from South Africa. The Summit will make policy recommendations for the G20 Leaders’Summit in Brisbane. The South African delegation to the Summit hopes to encourage South African leaders to read and understand the Y20 Summit’s declaration and what it is asking for. The declaration raises the Summit’s views on issues such as the youth’s role in economic and rural development. “The main focus will be on the issues that have greater relevance and impact on the developing nations in general and Africa in particular,” reads the delegation’s report. Meanwhile, SRC Treasurer-General Tshilande Pfuluwane attended the 28th International Youth Leadership Conference in Prague, Czech Republic. The bi-annual conference is a forum on world politics, international relations and justice and was attended by about one hundred outstanding students from the world’s most renowned universities. It blended social interaction with cultural and educational components and Tshilande had opportunities to rub shoulders with diplomats from foreign countries. “We were made to realize through experience the complexities of international relations,” he says. Tshilande participated in simulation exercises that recreated a United Nations Security Council crisis meeting, an International Criminal Court hearing, as well as a modern European Parliament session. To be selected as delegates, students had to go through a rigorous application process. NATIONAL PRIDE: The South African Delegation with CPUT SRC President Mbongiseni Mbatha (second from right) prepares its presentation to the recent Y20 Summit in Sydney, Australia.